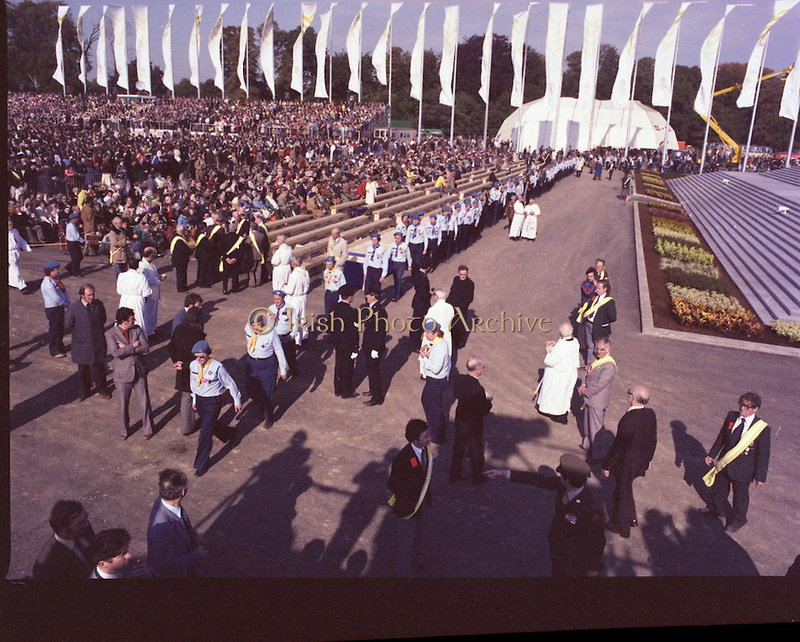 Pope John-Paul II visits Ireland..1979..29.09.1979..09.29.1979..29th September 1979..Today marked the historic arrival of Pope John-Paul II to Ireland. He is here on a three day visit to the country with a packed itinerary. He will celebrate mass today at a specially built altar in the Phoenix Park in Dublin. From Dublin he will travel to Drogheda by cavalcade. On the 30th he will host a youth rally in Galway and on the 1st Oct he will host a mass in Limerick prior to his departure from Shannon Airport to the U.S..The Catholic Boy Scouts Of Ireland (CBSI) who took part in the crowd control arrangements are pictured taking up their positions.